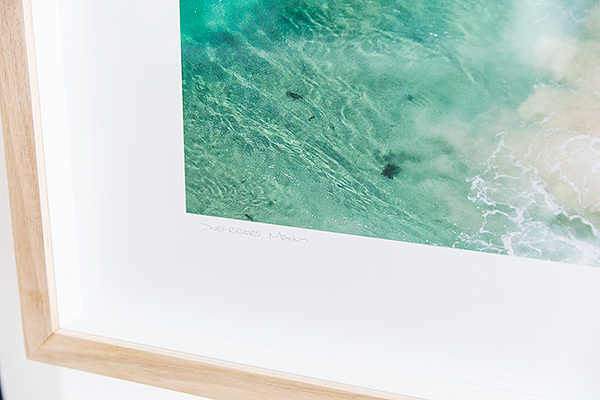 Our Tasmanian oak picture frames really take the presentation of photos to a whole new level and go perfectly with the images of the natural landscape. We print all these images on a metallic professional paper using the latest in Canon printing technology and they are then professionally mounted to aluminum to make them perfect flat, this is the most archival and professional way to mount photos. The making of the frame is a labour of love. It requires special cutting and putting together. Once complete it is then sanded smooth and cleaned ready for the next phase which is the insertion of the acrylic front and 3cm white stand off, that will recess the photo and give the frame depth. The whole process of creating a 60 x 40 inch framed Tasmanian Oak frame is about 5 hours of work, but it is well worth it. 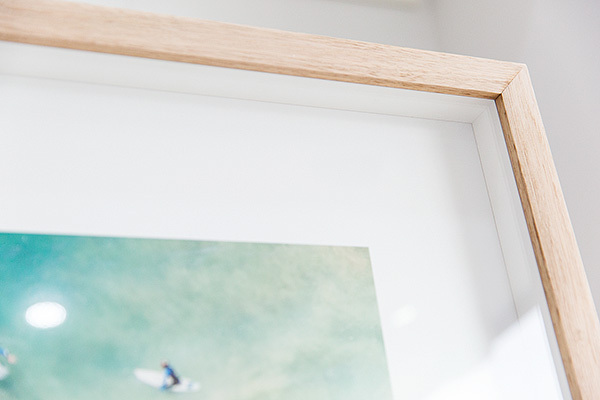 The frame is 7cm high and 3cm wide so it really stands off the wall and if the photo size isn’t enough of a feature the frame size itself is. 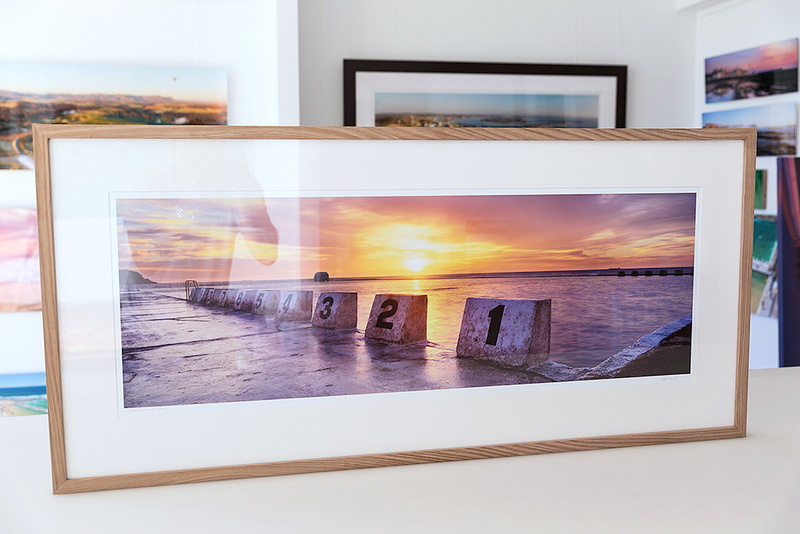 This framing type is only available for photos 40 inches and wider. For smaller pieces we use a smaller oak frame and stand off as it works with the size of the photo. 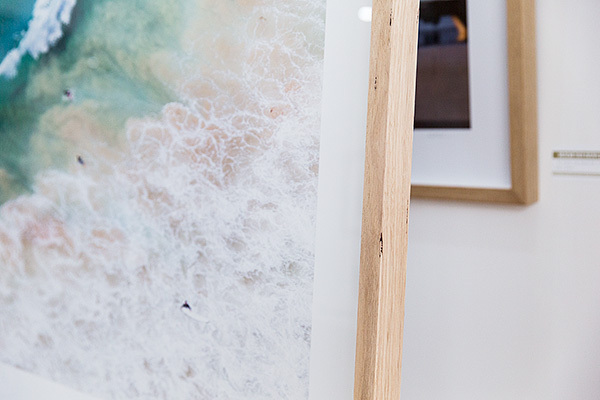 All our photo printing and framing is done by our Still Creations Photo Lab which is located at our gallery and handles all our work and is open to the public as well. 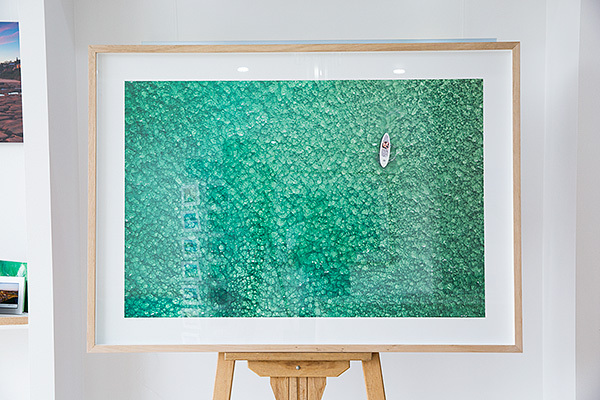 Tasmanian Oak Frame - 60 x 40 inch print. The 100% raw Tasmanian oak can come with beautiful knots. The photo is recessed 3cm with a white oak strip. 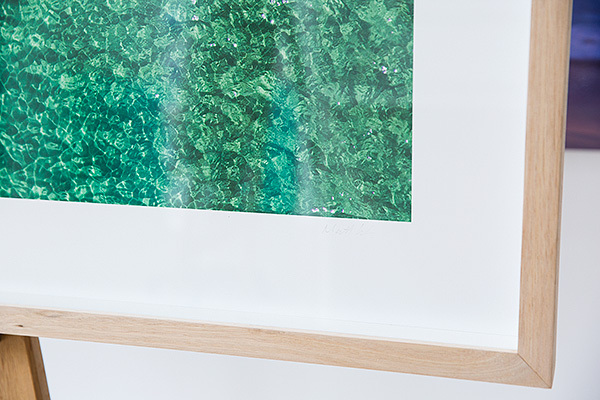 All photos are printed on metallic paper and mounted to aluminum. The 3cm stand off from the acrylic front gives the photo depth. 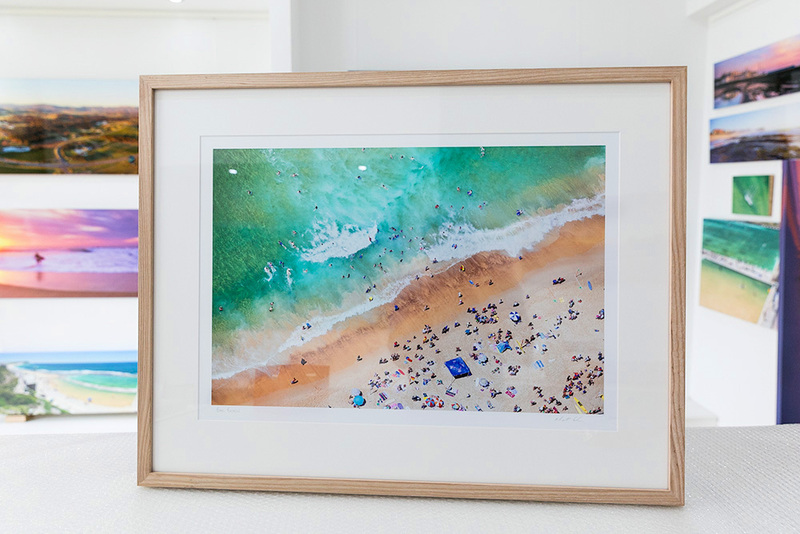 For framed orders in oak that are 40 inches wide and smaller we use a different method, it is still an exceptional result as you can see here on the left of this photo of Merewether Baths, Newcastle. 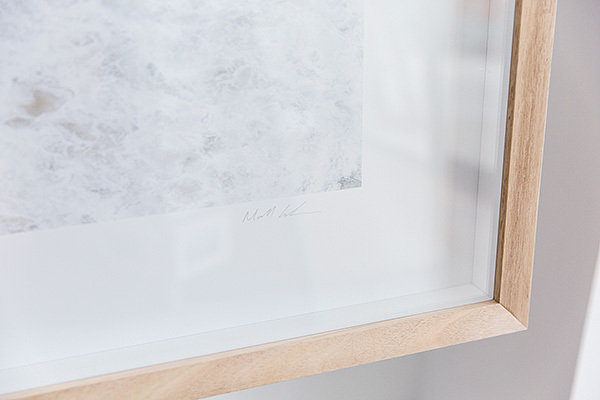 Printed on a metallic paper, hand titled and signed, archival white mat and oak frame. The smaller profile of the Oak frame is still 4cm high and 2cm wide. The depth complements photos this size. 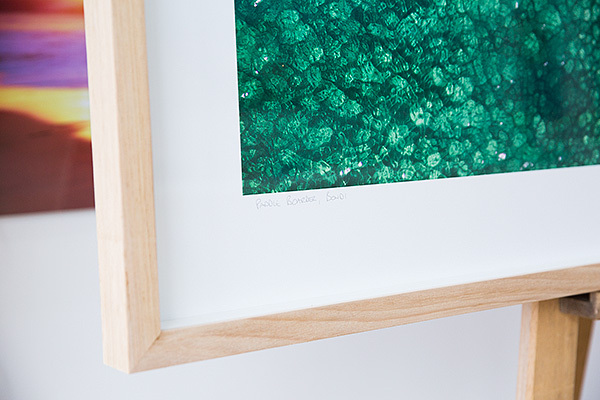 With the colours that are in our aerial photos it is really hard to go past framing them in anything but the Oak frame. The natural grain in the frame with the greens in the ocean and yellows in the sand is a perfect combination. 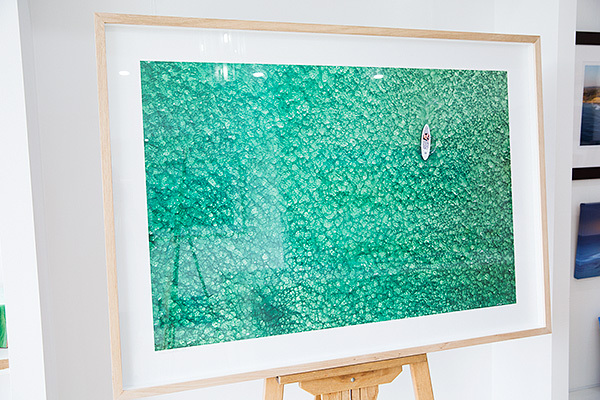 In this photo we have a 24 x 16 inch photo printed on our Kodak metallic paper, mounted with a white archival mat then oak frame.